One of the first things Brad ever made for me was an egg. I can't remember which came first; was it an omelet or a fried egg? Either way, the first time he fried an egg for me I nearly died. The yolk was runny and perfect for mopping up with my toast. I think that was the moment I fell in love with eggs. Or Brad. Or perhaps both? Since then, a week has rarely gone by without a poached, over-medium, sunny-side up or soft-boiled egg making an appearance in at least one meal. When we moved to Japan, I was elated to find that eggs are more important to the cuisine there than I could have imagined. I was introduced to eating raw eggs, which is not as scary as you might think, and soft-boiled eggs simmered in soy sauce and plopped over a big bowl of perfect ramen. These days, especially when I am eating in a rush or trying to save a little money on our weekly food budget, I like to make egg sandwiches. 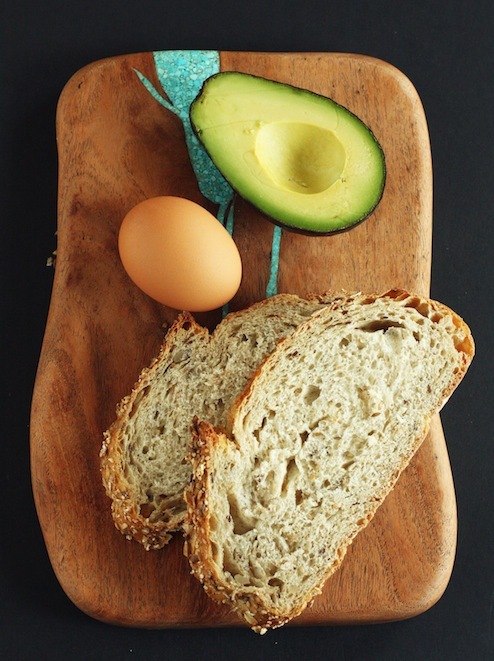 This has to be one of my favorite combinations- egg, avocado smashed with lemon juice, salt & pepper served on top of a piece of hearty wheat toast brushed with olive oil and rubbed with fresh garlic. Sinking my knife and fork into this perfect sandwich never fails to lift my spirits and comfort my soul. And my tummy. If you have 5 or 10 minutes to make lunch, or even a light dinner, you have more than enough time to throw this together. The bright yellow yolk and green avocado make an impressive plate for such a quick meal. I'm not one to argue with aesthetics like that and neither is my appetite. Here's to a great week with delicious, healthy, easy, and fast meals worth setting the table for! Heat the oven to 350 degrees. Brush both sides of the bread with 1 teaspoon olive oil and place on a baking sheet. Transfer to the oven and back for about 12 minutes or until the bread has been nicely toasted. Remove the toast from the oven and allow it to cool for a minute or two before rubbing it with the garlic. To rub the toast with garlic, take your garlic clove and simply rub it on the surface of the toast. This gives the essence of garlic without being overpowering. While the toast is in the oven, heat the other 1 teaspoon olive oil in a small, non-stick skillet over medium-low heat for about 2-3 minutes. Add the egg and allow it to cook until the white is opaque but still a bit runny on the top. Put a lid over the pan and turn off the heat. Allow the egg to continue cooking under the lid until the white is set but the yolk is still runny. Meanwhile, smash the avocado with the lemon juice, salt and pepper in a small bowl. 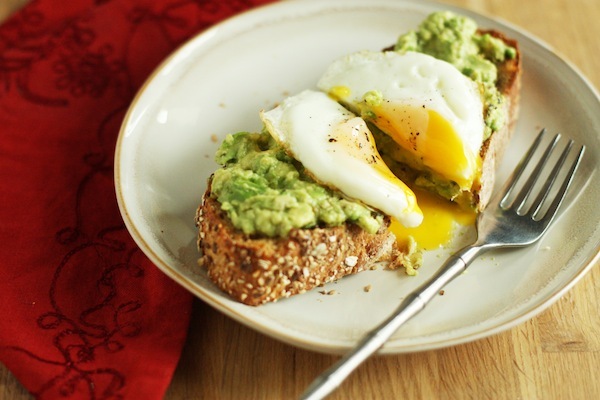 Spread the avocado over the toast and top with the egg. Sprinkle with a tiny pinch of salt and some more black pepper. Serve immediately.